Jumanji 3 will be gearing up for production in the not-too-distant future. Sony was quick to give the green light to another installment in the wake of last year's Jumanji: Welcome to the Jungle, which served as both a sequel to the original Robin Williams classic and a total reinvention of the franchise. 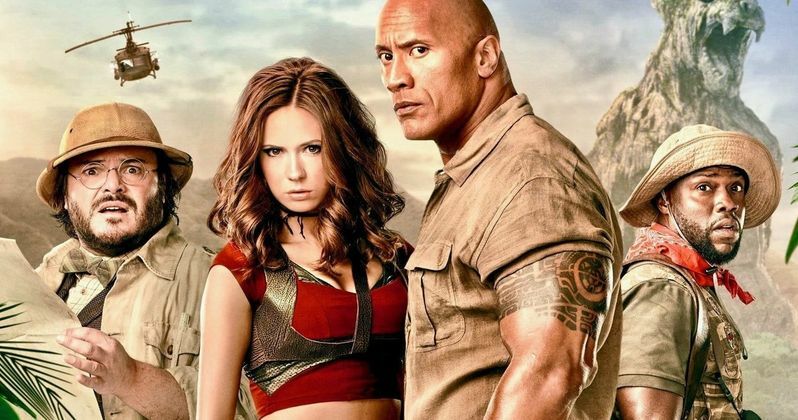 Dwayne Johnson, Kevin Hart, Karen Gillan and Jack Black won't have been away for long, as a new report states that filming on the third movie in the series will begin early next year. According to a new report, Jumanji 3 will begin filming on January 21, 2019, in Atlanta, Georgia. It's also expected that the movie will do some filming in Hawaii. The shoot is expected to last roughly three months, with production expected to wrap up at the end of April. This new report also adds that Andrew Max Cahn (Captain Marvel) has boarded the production as an art director. This lines up with what Kevin Hart had to say in a recent interview with Variety while promoting his latest comedy Night School. "We start shooting at the end of January. We almost made a billion dollars with the first one, so to have the opportunity to repeat that same level of success is beyond exciting. To get that whole crew back is exciting. I'm pumped up about it." Sony wasted absolutely no time in getting this sequel going. Director Jake Kasdan is expected to be back in the director's chair and they've done everything they can to keep the same team in place that made the last movie such a success. One tricky part is Dwayne Johnson, who has been unreasonably busy over the last handful of years. He's got a ton of projects on his plate, having just wrapped up Disney's Jungle Cruise only to immediately shoot the Fast and Furious spin-off Hobbs and Shaw, with his original thriller Red Notice on the burner, in addition to another season of HBO's Ballers. However, Jumanji 3 became a priority for both The Rock and the studio. So he shifted some things around and that will be one of the next things the wrestler-turned-actor will shoot. This production schedule will be right though, assuming the studio sticks to their release date. At the present time, the movie is scheduled to hit theaters on December 13, 2019. Given the success Jumanji: Welcome to the Jungle enjoyed, it's incredibly likely they will stick to that date. The sequel dramatically over-performed, bringing in $962 million at the worldwide box office, even though it opened up very closely to The Last Jedi. The third installment will be facing a similar challenge, as Star Wars 9 is slated to hit theaters on December 20, 2019. At the present time, no story details have been revealed for Jumanji 3, but we'll be sure to keep you posted as any new details are made available. This was first reported by Geeks Worldwide.